SRINAGAR: The visiting Chairman, Press Council of Nepal, Kishore Shrestha on Sunday said Kathmandu will host a delegation of Kashmir journalists this winter and the Press Council of India will do the necessary arrangements in consultation with the Directorate of Information and Public Relations Jammu and Kashmir. This is part of the region interaction and exchanges that have not been taking place after the unmaking of SAFMA. Shrestha, who has been interacting with the media professionals, regulators and the government functionaries for last few days, is accompanied by a senior member of the Press Council of India C K Nayak. Sunday afternoon, the two dignitaries had meetings with various media professionals in the Aiwan-e-Suhafat, the Kashmir Press Club that has opened very recently. Shrestha said Nepal has a robust media fraternity and has 14000 media professionals who work for hundreds of newspapers and more than 150 TV channels. He said the Nepal media also had a patch of tensions because of the Maoist insurgency. Hosting the two dignitaries for a series of meetings was the maiden event that the Aiwan-e-Suhafat hosted. 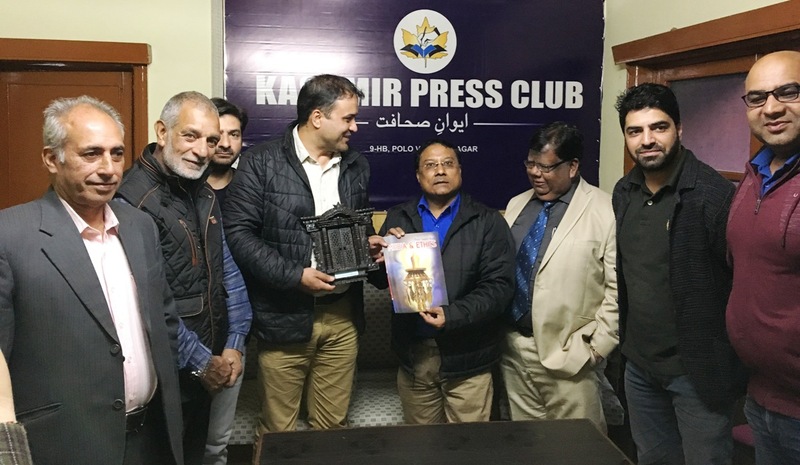 Functionaries of the Club including Ausif Qureshi, Merajuddin, Haroon Rashid and Mohammad Mouazam were part of the interaction and were joined by few members of the Kashmir Editors Guild including Manzoor Unjum, Shafat Kirra and Masood Hussain. Shrestha handed over a memento to the Press Club functionaries. Host media professionals gave the visiting dignitary of the evolution of media in Kashmir and how it has survived an overwhelming situation. They said though they have paid huge costs for helping the institution of free media to survive, the Srinagar media corps has evolved into one of the highly professional conflict specialist media that has covered Nepal, Sri Lanka, Myanmar, Syria, Kuwait, Libya and Afghanistan for some of the world’s best media houses. They said the struggle for sustaining an objective and fair media continues. Shrestha said there is a requirement for the media in the entire region to meet as frequently as possible and exchange ideas and learn from each other’s experiences in understanding and reporting socio-economic developments. Nayak said the fall of SAFMA has become a disruption and now Press Council of India is attempting engagements with the regional media bodies for this purposes. It is under this plan that Kashmiri reporters will be facilitated to have a trip to Nepal and in response, a Nepal delegation will visit Srinagar later. He has already discussed the idea with the Director Information Tariq A Zargar. Kashmiri journalists said Kashmir and Nepal have historic relations and a huge Kashmir origin community has immensely contributed to the socio-economic well being of Nepal. They said they will be happy to report about Kashmir’s Nepal connections that have been there for centuries. Nepal has a very strong Kashmiri community in business especially in the hospitality sector and some of them are in media too. Referring to long back good relations of Nepal with Jammu and Kashmir State, the PCN Chairman said, “We want to strengthen these relations more effectively now by initiating new steps like an exchange of Journalists”. He said that initiative is good for journalists, saying it will help in understanding the situation in which journalists of Nepal and J&K are working, besides help in developing good professional relations. The Media Bodies which met PCN Chairman included Kashmir Editors Guild (KEG) led by Masood Hussain, Editor Kashmir Life. KEG delegation also included Manzoor Anjum, Editor Daily Uqaab, Haroon Rashid, Editor, Nidai-e-Mashriq, Shafat Kira, Editor, and Kashmir Vision. A delegation of JK Editors Forum led by Rashid Rahil, Editor Asian Mail also met the PCN Chairman. The delegation comprised Umar Farooq, Managing Editor Rising Kashmir, Arshid Rasool Editor, Daily Gadyal, Chesfeeda Shah Editor Kashmir Scan, M Sadiq Editor Flaqi Shigaf, Arshid Mir Editor Kashmir Headlines, Mushtaq Bala Editor Kashmir Pen, Ajaz Ahmad Editor Farog-e-Kashmir and Manzoor Zahoor Bureau Chief, Daily Mashriq.